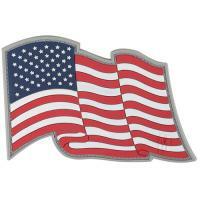 The Star Spangled Banner Morale Patch from Maxpedition is the perfect way to show pride in your country. It is fashioned from durable PVC rubber for guaranteed lasting service life. Its contoured shape and bold colors give it the design a realistic, three-dimensional appearance. The patch features a hook-backing that attaches securely to any loop field, including those found on a variety of Maxpedition bags, making it easy to customize equipment. It also comes with a separate loop field that can be sewn onto other equipment or clothing for more permanent wear, or used to protect the hook-backing when not in use.